Genuine replacement nib for the Pelikan M600 fountain pen (and other Pelikan models based on the M600 such as Special- and Limited-Editions). 14k gold with rhodium accents. All Pelikan M600 nibs are fully tuned and tested prior to dispatch. 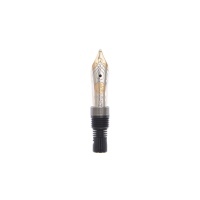 This nib will also fit all M200, M205, M215, M400 and M405 models but this is not recommended.